Choose from multiple classes, such as knights and mages, pick your characters to control those classes, like grandma or kid brother, and take on the loads of quests, monsters, items and equipment littered throughout Knights of Pen & Paper. Blacksmiths, enchanters, mining, gathering, hidden treasures and a whole lot more await, giving players a lot of room to personalise their gameplay experience. 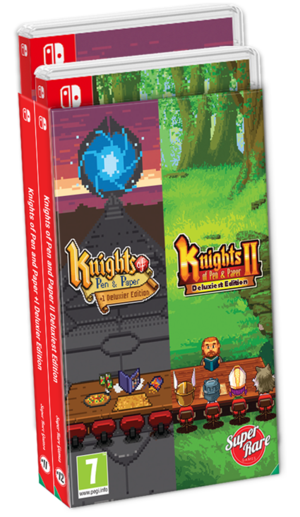 GoNintendo Exclusive - Super Rare Games releasing physical versions of both Knights of Pen and Paper +1 Deluxier Edition and Knights of Pen & Paper 2 Deluxiest Edition! Super Rare Games today have announced their partnership with Plug In Digital, Seaven Studio and Behold Studios to physically release the first two Knights of Pen and Paper games for the Nintendo Switch™ - only 3,000 copies of each title will be on sale, and pre-orders for the game open on the 24th of January exclusively at superraregames.com. Super Rare Games has worked on some of the biggest and most loved indie games on the console, recently they have released Worms: W.M.D, Snake Pass and The Adventure Pals . Having only formed in February 2018, they have quickly become a staple for any video game collector. Enjoy hours and hours of adventures in these turn-based, retro style, pixel-art RPG full of danger, intrigue, and semi-appropriate cultural references! Knights of Pen and Paper +1 Deluxier Edition and Knights of Pen & Paper 2 Deluxiest Edition both include all of their ever-released expansions with many new characters, enemies, quests and locations! “As someone born in the late 90’s, I ironically have a weird affinity with the culture of the 80’s! From the music, to the games to the TV shows, I love it all. Dungeons and Dragons is still one of the best board games ever made and I feel ‘Knights of Pen and Paper’ captures the fun of it perfectly. It then goes that step further and innovates on that concept, adding in witty dialogue and an amazing set of customisable characters and missions. I really think our fans are going to love experiencing these two games! ” said George Perkins from Super Rare Games. The Super Rare edition will include a cardboard slipcover with two fully assembled switch games. Each one comes with a 12 page full colour insert, interior artwork, exclusive sticker and a three trading cards randomly selected from the five-card set. For more information about Knights of Pen and Paper please visit WEBSITE and follow Super Rare Games on Twitter for news and updates. Started in 2012, Plug In Digital is one of the largest independent video game distributors. We help studios and publishers distributing and increasing their sales worldwide on PC, Consoles and Mobile. We are a driving force behind indie successes such as Dead Cells, Furi or A Normal Lost Phone and a key partner for high-profile companies such as Paradox Interactive, Bandaï-Namco, SNK, Konami or Curve Digital. A HUGE thanks to Super Rare Games for sharing this exclusive with us! Hello boys and girls! Great news today: Knights of Pen and Paper 2 release date on consoles! Christmas time. After bringing Knights of Pen and Paper +1 Deluxier Edition to modern consoles back in May, we're very happy to partner with Kyy Games and Behold Studios again and bring Knights of Pen & Paper 2 - Deluxiest Edition to Nintendo Switch, Xbox One and PlayStation 4 as well! It will release for $12.99 on December 13th on Nintendo Switch. You can pre-order the game today on Nintendo Switch and Xbox One. Also starting today, you can pre order a Knights of Pen and Paper Bundle, which obviously brings the two games together, for $22.49 that will release at the same time! That's a cool 20% saving compared to buying both games separately. If you already own Knights of Pen and Paper +1 Deluxier Edition on Nintendo Switch, you can buy Knights of Pen and Paper 2 Deluxiest Edition 20% off as well! So! Are you ready to join Knights of Pen and Paper 2 Deluxiest Edition in a turn-based, retro style, pixel-art adventure full of danger, intrigue, and semi-appropriate cultural references! It will contain all content ever released on PC. Don't forget that our partner Super Rare Games will bring both Knights of Pen and Paper +1 Deluxier Edition and Knights of Pen & Paper 2 - Deluxiest Edition to limited physical edition on Nintendo Switch, early 2019!